We just had the tune on the DriftZ touched up to suit the Forged internals and new cam. We still have a boost problem that we have to sort out, as it drops from 12lbs of boost to 8lbs of boost once we get over 4000rpm. We had to dyno the DriftZ in 5th gear, which is overdrive and 0.8:1 as we could not get traction in 4th gear which is 1:1. The dyno had to be done with approx 400kg of weight in the boot to reduce the wheel spin. 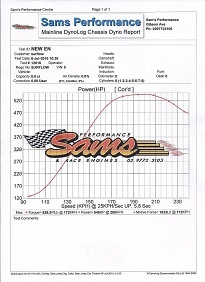 Normally, the dyno would be done in 4th gear which is a ratio of 1:1. The results means the torque figure especially, is a lot lower than what we actually have due to the dyno being done in an overdrive gear. Not bad though, 545hp at the wheels and 829FtLbs of torque. Once we fix the boost problem, the power will be well over 600hp at the wheels! The DriftZ finished the 2009 Drift Australia Championship, competing against the best cars in Australia, in 4th place and we were pipped out of the Top 3 because of some minor gremlins that occurred at Oran Park. The races were too close together to repair the car in between races and it was too hot to work on. These gremlins took around an hour to fix, once the engine had cooled down after the event had concluded. 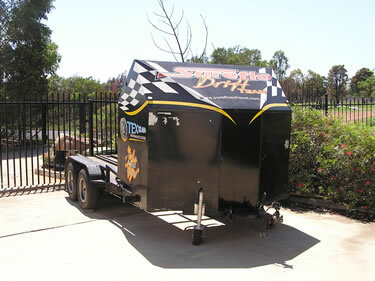 Cars came from all over Australia to compete in this event which was televised on SBS. The day itself was hot and lots of cars had dramas along the way. When we were fighting for 4th position, a storm hit blowing dust in from the Rally track which coated the Drifting surface. To make matters worse, the heavens opened up and the rain poured down, making the track slippery and greasy. Dan spun on the first corner, and then had to recover and make a fight out of it. The car he was battling had engine problems and went to the pits for repairs and did not return. Our engine had cooling problems and was over heating badly. Not only this, but the external wastegate kept jamming intermittently which caused us to lose boost and it always occurred at the time we needed boost the most, and because it was intermittent, the car became unpredictable to drive. In our battle for 3rd position, we had to wave the other car past as we could no longer get any boost, and with the semi comp tyres fitted, we didn’t have enough power to Drift properly. We later found that 2 of the spark plug leads had disintegrated with the heat off the turbo manifolds and we were only running on 6 cylinders. The spark plug leads have fire proof insulation over the top of them, but this had disintegrated as well. In the off season we have made many changes, including forged internals in the engine, custom made wide body kit, new front bar, relocated the spark plug leads and coil packs, more lock on the steering rack, and we have fixed our unpredictable boost problems. The car is now a dream to drive, has plenty of power and lots more angle. It is impossible to get an accurate dyno number as the car shreds the tyres on the dyno in both 4th and 5th gear with the straps as tight as we can get them and 4 people sitting in the boot to hold it down. This is on 10 – 12lbs of boost which is pretty minimal. It has enough power to do the job !!! We took the DriftZ to Wakefield to get a Lap time. It was still set up for Drift, but with slicks all round. With a passenger on board, she managed a 1:043 second lap, which is around Lap Record time for some of the Porsches. Doing 160 – 180km/h down the straight, when he pulled 4th gear, if he put his foot down it shredded the 300mm wide slicks. With more traction a sub 60 second lap is possible, and this is V8 Supercar lap record times. This is a video clip of the DriftZ in action against the Autosalon car at Eastern Creek in 2008. Drift/Circuit/Drags – this is a quick fun car. Nissan 300ZX with a turbo LS1 Chev engine with forged internals. Full cage for safety, custom wide body kit. Comes with all spares, car trailer, tyres, wheels, etc. 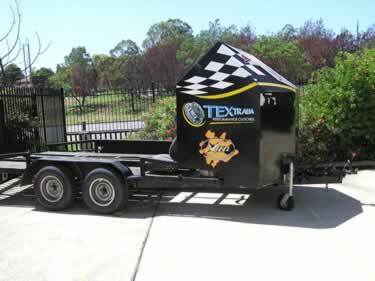 Car trailer has enclosed front with tyre rack and electric brake controller. Electric brakes. Over $200k spent. Engine just rebuilt.